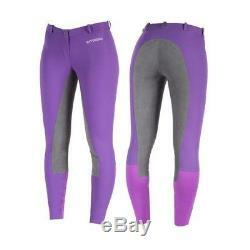 B Vertigo Lauren Women's Full Seat Dressage Riding Breeches Mid-Rise Waist. These mid-rise traditional women's full seat dressage breeches have plenty of style and class while maintaining durability and comfort with 4-way stretch and moisture-wicking cool fabric. The elastic lower leg is comfortable and the simple front will look smooth under a competition coat. Be the first to receive exclusive offers and promotions. Listing and template services provided by inkFrog. The item "B Vertigo Lauren Women's Full Seat Dressage Riding Breeches Mid-Rise Waist" is in sale since Friday, July 7, 2017. This item is in the category "Sporting Goods\Outdoor Sports\Equestrian\Clothing & Accessories\Women's Clothing\Jodhpurs & Breeches". The seller is "onestopequineshop" and is located in Beloit, Wisconsin. This item can be shipped to United States, Canada, United Kingdom, China, Mexico, Germany, Japan, Brazil, France, Australia, Denmark, Romania, Slovakia, Bulgaria, Czech republic, Finland, Hungary, Latvia, Lithuania, Malta, Estonia, Greece, Portugal, Cyprus, Slovenia, Sweden, South Korea, Indonesia, Taiwan, South africa, Thailand, Belgium, Hong Kong, Ireland, Netherlands, Poland, Spain, Italy, Austria, Israel, New Zealand, Philippines, Singapore, Switzerland, Norway, Saudi arabia, Ukraine, United arab emirates, Qatar, Kuwait, Bahrain, Croatia, Malaysia, Chile, Colombia, Costa rica, Dominican republic, Panama, Trinidad and tobago, Guatemala, El salvador, Honduras, Jamaica, Antigua and barbuda, Aruba, Belize, Dominica, Grenada, Saint kitts and nevis, Saint lucia, Montserrat, Turks and caicos islands, Barbados, Bangladesh, Bermuda, Brunei darussalam, Bolivia, Ecuador, Egypt, French guiana, Guernsey, Gibraltar, Guadeloupe, Iceland, Jersey, Jordan, Cambodia, Cayman islands, Liechtenstein, Sri lanka, Luxembourg, Monaco, Macao, Martinique, Maldives, Nicaragua, Oman, Peru, Pakistan, Paraguay, Reunion.